I take it everywhere and use it to soothe my nerves in the sea of road construction that is suburban Chicagoland. It makes me less cranky. Just started the waist shaping. If you’re wondering where, I’ve been…well, aside from working and shuttling my kids around to and from 56875607 summer activities, I’ve been here. omg. Love. this. site. I got my invite on Monday night (after weeks of patiently waiting — really, I wasn’t cranky at all!) and was immediately sucked in. Soooo worth the wait, and I am so excited about its potential. 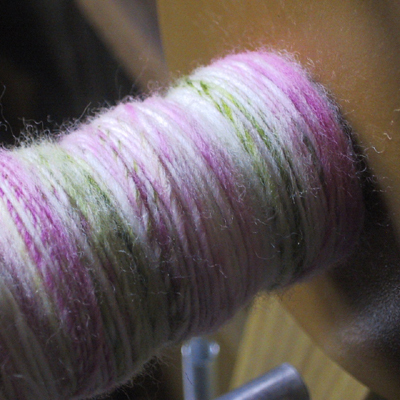 It’s hard to totally grasp until you can join and explore — but in a nutshell I’d say it really brings out what’s so awesome about the online knitting community. We’re so…collaborative. There’s so much good will floating around. These people bought me a spinning wheel, for crying out loud! I’ve spent about an hour a day this week entering projects, as have many, many people before me. It’s so like knitters to give to a project like this — because we all know how much it will benefit the online knitting community. And I really think that those who join later will really benefit from the info that’s accumulating during the beta period. It’s so flippin’ phenomenal that instead of launching a comprehensive Google search, combing through blogs and flickr albums looking for information on a given project, I can just enter the name of said project on Ravelry and check out photos, find out who knit it, what yarns they used, what the pitfalls were, how they felt about it. The engine is fantastic, but what really pushes it over the edge is the user content. tell: My gut did not fail me. 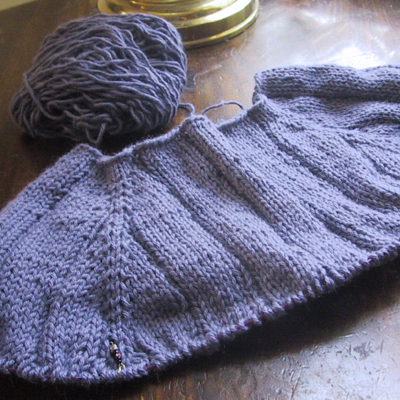 I finished the neck on the raglan, and it looked great. Exactly what I wanted. Once I knit half a sleeve, I tried it back on and it’s wonky. 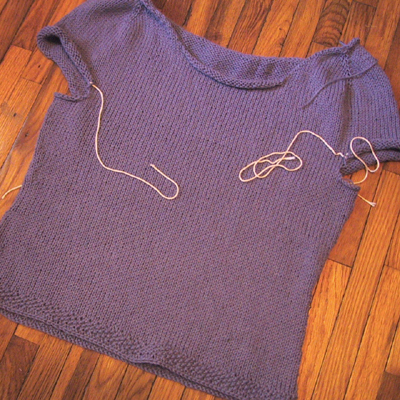 I think I’m going to have to frog the whole thing…because the wonkiness stems from the fit at the armholes. Sigh. 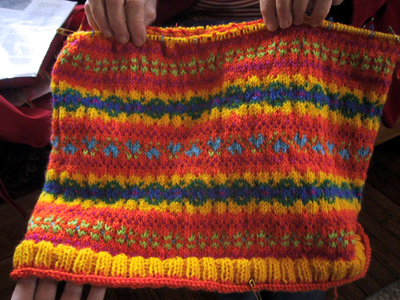 show: Since my own knitting news is so depressing, I thought I’d share a photo of what my mom is knitting. Isn’t she the bomb?? Even though I’ve tried it on approximately 456897 times, I still have a great fear that the fit will be wonky. I think I’ll do the collar next, then decide whether I want it to have short or long sleeves. …knowing that I will have zero time to work on it. So beautiful. All pre-drafted and everything, waiting for me to spin. Sigh.